I have always been an avid reader. I love a good read, whether it’s fiction or someone’s life story. Ever since my husband gave me an iPad for my birthday when it first came out, I’ve been purchasing e-books and pouring through them with reckless abandon. It has greatly alleviated the space and weight issues during our travels. 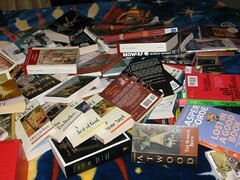 We also don’t have to solve the issue of storage space for books in our home. At least, not for now. Daryl’s recent query about whether too much of a good thing might be—bad(? ), gave me pause. What is it that makes me enjoy a good read? A good plot, of course, is one. After all, a story has to have good bones. It would have to be plausible. It would have to make sense, even if it were fantasy, as in Harry Potter or Lord of the Rings. I’d have to be able to follow the writer’s logic or reasoning. I think it’s even more difficult to create a world and make it believable. Writers would have to “live” in the world they created. There are books that are character-driven. And so, a writer would have to illustrate the various dimensions to the person to render them real, even larger than life. This will give them enough complexity to seem real to a reader. The progression of events should be one that can be navigated without having to think, “Wait. Why is this happening?” accompanied by a frantic search for the link a few chapters back. Flashbacks are fine but their use should serve a purpose and not just for the sake of having flashbacks. It’s important for a writer to be a good story-teller. There could be wit and humor injected. There could be similes, metaphors, alliterations, onomatopoeia, and whatever other writing tools are out there. The prose should flow and not be too contrived or forced. It should not feel hollow or fake. I find that if I’m having to go back several pages or chapters to refresh my memory on some key events or if I’m mentally gesturing the writer to hurry up already, chances are, I’ll be donating the book or giving it away, unfinished. Once in a while, I’ve even commented online, usually to praise vociferously or to express my utmost disappointment. And so, Daryl, yes, too much of a good thing can be bad. But stripped, stark, brief, and to-the-point writing might as well be a scientific paper. That’s not literature. That’s work! This entry was posted in Uncategorized and tagged Arts, books, fiction, Novels, Plot (narrative), postaday2011, postaweek2011, reading, Writer, Writing. Bookmark the permalink. Stopping in to say hello. I haven’t seen a post recently and hope all is going well? …Thank you for the beautiful poem on your recent comment. I hope people will truly appreciate the spirit of Veteran’s Day. Okay, I may not be a book person other than my son’s story books but I’m passionate about reading people’s blog. It may not be as long and detailed as a book but it does tell an interesting story, most of which real life experiences that I can easily relate too. In a way, all your key points can be applied to it. A great and engaging post, even addicting at times is something that has an irresistible, interesting plot that holds the readers to the end, should just be long enough to deliver the thought without dragging in the middle of have people go to asleep or perhaps drift to another dimension, should have a heart that touches the emotions, should be stimulatng enough to stir any mind in absolute excitement. Now as to much of a good thing might be bad? Could be. Great post my friend. I learned so much just from reading your post. Have a blessed weekend. I have always loved to read books too, but I think I have always loved books in themselves. Thus I would never be able to turn into an e-book-reader, although I see the practical aspect of it. You say that one should be able to navigated without having to think. To some degree I agree, but I also like when an author challenges me, so that I will have to think what he or she actually means – or how I perceive the text myself. I really like when a story isn’t obvious. As to digression, I totally agree, that’s for instance why I have never able to really enjoy John Irving. Too much details on the side that I don’t need to know. Hahaha! It took me a while to become accustomed to the entire concept of the e-book too. At first, I read The New York Times daily. I kept telling people I like the action of turning the pages with my fingers. I savored the smell of a newly printed book. Then I ordered my first e-book. I read the then famous trilogy by Stieg Larsson, because everyone was raving about it. I was hooked! We went on vacation and I loaded my iPad with 12 books. My husband loved it. He did not have to lug around a suitcase half filled with books that would likely have to be left behind as we accumulated souvenirs. I’m sorry if I misled you into thinking I don’t like a good challenge. I do, actually. What I meant was, I don’t like the progression to be so convoluted that I have to keep going back a few chapters just to understand the story’s progression. I agree about John Irving. Felt the same way about Umberto Eco.